Remember my problem of not being able to decide which color I wanted to wear? I solved that. With skittles. 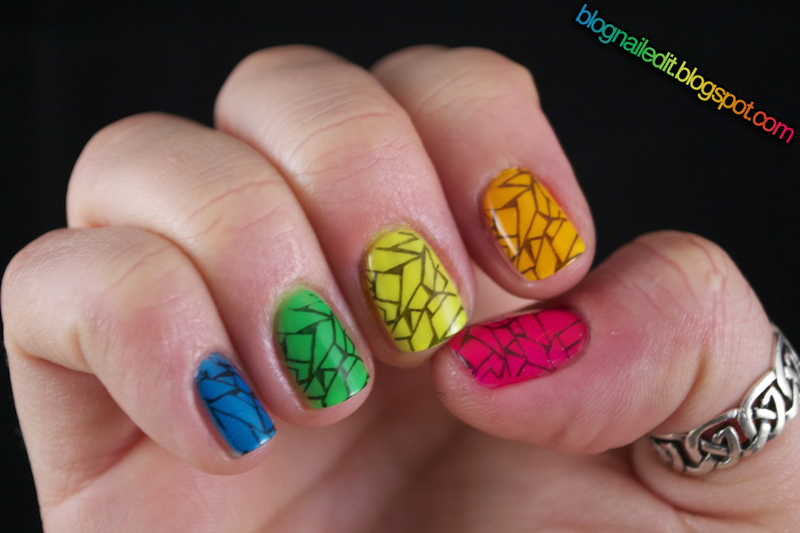 Cracked skittles. The kind you used to smoosh together to get a combo flavor. 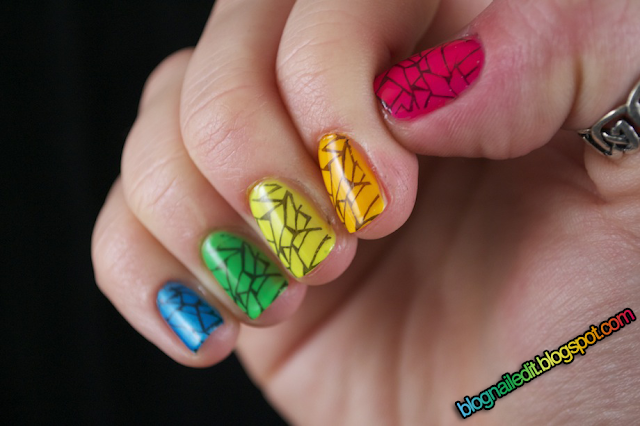 (I personally did that more with Starburst, but I can't really make Starburst nails...or can I? Challenge accepted!) That was a long aside. Rainbow colors are brought to you in part by China Glaze. Introducing Pool Party, Sun Worshiper, Yellow Polka Dot Bikini, and Kiwi Cool-Ada. Also: Color Club, Pure Energy since 1979. New from Sinful Colors, Black on Black not included, some restrictions apply. I am really loving this mani!!! So awesome! Thanks ladies! This is definitely one of my favorite stamps. The plate also has a negative of that same pattern. So instead of black lines, you would get black plates, with open lines showing the color underneath. It's a gorgeous stamp. I'd like to try something where I fill in some of the gaps, but they may look too gloopy. I'm following you now, wanna follow me too? These look SO fun and cute! Great pics!